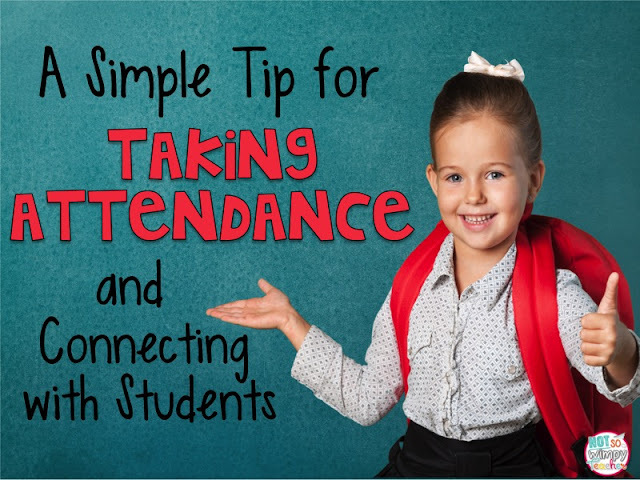 Many classrooms have students do the attendance. Students are using a digital white board or a clip chart to record their presence. Not in my classroom! I have a student led classroom, but taking attendance is one thing that I will NOT let go of. Here is why....it is the perfect time to connect with each and every child! When I call attendance, I do not just call a student's name. I always look right at the student and use their name. So It sounds like this, "Good morning, Tyler." I smile at him. My students are trained to look at me, smile and reply, "Good morning, Mrs. Sears." I have talked with my students about it feels so good to be called by name and that smiles can change a person's mood. My students are encouraged to learn all of the last names of volunteers, aids and specialists that work with them. If they know their names, they can properly address and thank these adults. It would be easier and faster to have students move a clip on a chart or to just look and see if there are any empty desks. But it feels so good to start every day with 24 smiles and greetings. I start my lessons with a full and happy heart and that makes me a better teacher. Some of these students are never hearing their name spoken kindly at home. They need the positive connection that my voice and smile can offer first thing in the morning. I feel the three extra minutes that it takes is time very well spent. How do you take attendance? How do you greet your students in the morning?